I have just returned from a holiday in Hawaii. The trip was not meant to be a major photographic expedition, but I could not resist the temptation to take a camera with me. 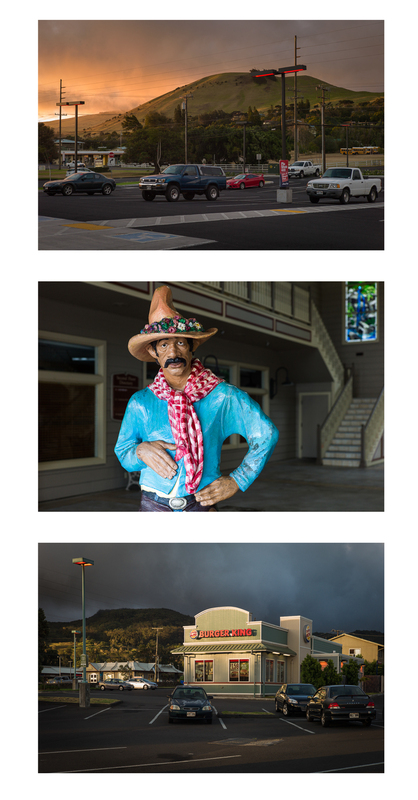 I travelled light taking my Leica M9 with 35, 50 and 75 mm lenses. I had no particular project in mind before I set off. My thought was to see what opportunities presented themselves and to go from there. We were staying in a place called Waimea, which is on the side of an extinct Kohala volcano (well almost extinct) in the north of the Big Island of Hawaii. What struck me immediately was how different it is compared with the stereotypical image of Hawaii as a place of beaches, palm trees and surfers. It is situated at an altitude of around 3000 ft and the surrounding countryside is hilly grassland. This gave me the idea for a project which was about presenting an alternative representation of Hawaii – Another Hawaii – very different from the cliche version. My approach has been to make landscape and urban scenes at twilight and in interesting weather conditions with low cloud, storm clouds, raking light and such like. All of the photographs were made at locations close to where I was staying. I was particularly struck by the rapidly changing climatic conditions and the wonderful light. This was to form a key feature of the work. The overall tone is dark and the images low key – a deliberate strategy to distance the work from the sunshine and blue skies of postcard images. I had not anticipated the project and so was not consciously influenced by the work of other photographers. With hindsight and input from others it is clear to me now that the work could be compared to that of other photographers. The emphasis on light and the weather recalls Joel Meyerowitz’s ‘Cape Light’ which is one of my favourite landscape photography books. The dark suburban scenes seem to echo Todd Hido’s ‘House Hunting’ – something which was mentioned by tutor Clive White when he commented on my Flickr site. I have since looked at Hido’s work and find it intriguing. The way in which an ordinary place such as a suburban house can when pictured at night take on an air of mystery and be a vehicle for the invention of narrative is very striking in Hido’s work. This idea is one which may influence my East End work. The final image is one which I took at the end of the holiday. It was made from a moving vehicle along the Kohala Mountain Road on the way into Waimea. 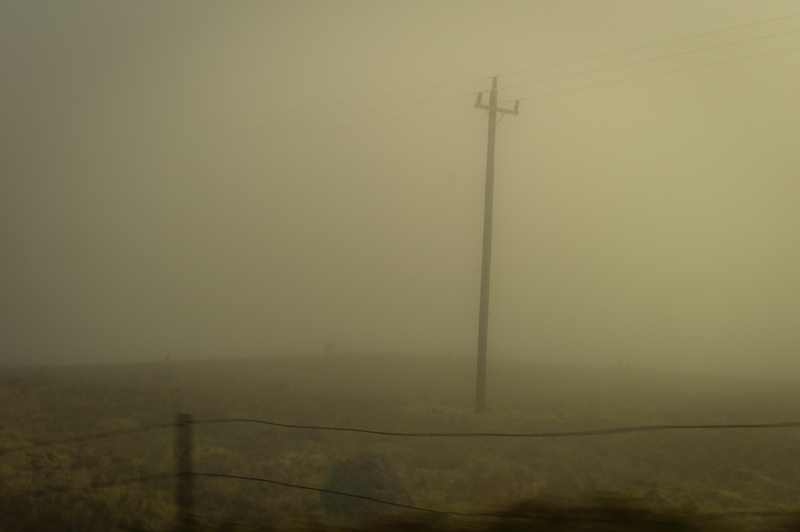 The cloud cover is very low and an isolated telegraph pole is pictured in an otherwise desolate scene. The mist and slight blur from the movement of the car gives this image a sense of mystery. For reasons I cannot fully explain this image captures my memory of Waimea as a surprising and intriguing place. The lonely telegraph post may however be too much of a cliche but…. As I said above ‘Another Hawaii’ is work in progress and I hope to revisit it again….we shall see. What did I learn from this project… In the main I think that this small project re-emphasised some lessons I learned during my OCA Advanced photography course – the need to keep an open mind and remain flexible in my approach, the importance of a consistent formal approach, being open to influences from other photographers. But most of all I think that I found the very freewheeling approach I took to this work refreshing. I must keep reminding myself that I need to avoid being overly prescriptive about my work!! Some of these photographs were taken with the project on the principles of Gestalt Theory in mind. This will be part of my submission of the first assignment. In previous posts I have presented a second piece of work which I made in Hawaii which was very much about photography and memory – ‘Grove Farm Memories…’ – see my previous posts here and here. Click on the image below to see the final version of this short video. I’ve followed you on Flickr and been impressed by the quality and interest of the photographs you’ve posted. You’ve certainly shown the alternative side of Hawaii which is far, far different from my own perceptions as someone who has never been there. Thanks Catherine….hope all is well with you. I have just about broken free from my other diversions and will be back at work on YOP very soon. Oh, these are fantastic Keith!! They’re really atmospheric and it’s lovely to see your ‘take’ on the place. Fab! Yes, we must definitely get together for another Thames look around. I shall now have to seek out Turner and the Thames! My course is absolutely brilliant! Loads of reading, visual work and critiques and of course essays. I’m constantly excited by it, I will be adding to my Woolwich work and submitting that as part of my first visual assignment which means that the day we had there has yet another layer of meaning. Rather precious!